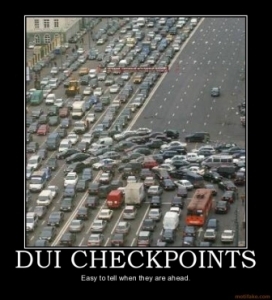 LA Weekly regularly keeps tabs on Los Angeles DUI patrols and checkpoints, to the ire of some law enforcement officials and others who worry that publicizing news about checkpoints can have a negative impact on the deterrent. One of the reasons why police establish checkpoints at relatively random locations is to leverage the element of surprise. So critics worry that, when papers like LA Weekly reveal maps of DUI checkpoints, then at-risk drivers might be more likely to “let loose” and drive in a more cavalier and dangerous fashion. While this fear is understandable, it begs the question: is there any actual evidence that publicizing locations of checkpoints actually does cause harm? Here’s the reality. Journalists might argue that revealing checkpoints does no harm. And some in law enforcement might argue the opposite — that it does endanger the public. But we really don’t have impeccable science to support either position. In light of that, it’s interesting to note when and how the Los Angeles Police Department and other agencies set up their checkpoints. On Thursday November 6th, for instance, per the LA Weekly, the LAPD set up saturation patrols in the Olympic Division near Koreatown as well as the Central Division. Pasadena Police, meanwhile, set up a saturation patrol in Pasadena. On Friday, police set up a DUI checkpoint in Panorama City at Roscoe Boulevard and Nobel Avenue. On Saturday, police ran a checkpoint at Vose Street and Sepulveda Boulevard, in Van Nuys. And on Sunday afternoon, police patrolled for DUI drivers in North Hollywood from 5 PM to 1 AM. Whether police rounded you up at one of these checkpoints, or you found yourself behind bars after causing an accident on the 405 or the 101, or you failed field sobriety tests, such as walk the line or finger the nose, you need powerful insights and an effective advocate to win your freedom. Call the Kraut Law Group today to schedule a free consultation with a Los Angeles DUI lawyer — a former Deputy District Attorney with nearly two decades of experience.